Charles Portis has long been acclaimed as one of America's foremost writers. True Grit is the basis for two movies, the 1969 classic starring John Wayne and the Academy Award® winning 2010 version starring Jeff Bridges and written and directed by the Coen brothers. 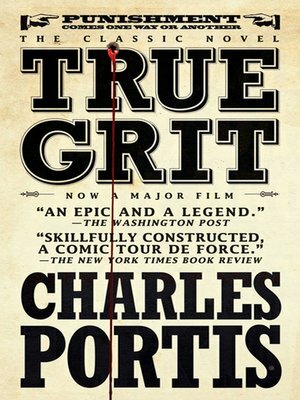 True Grit tells the story of Mattie Ross, who is just fourteen years of age when a coward going by the name of Tom Chaney shoots her father down in Fort Smith, Arkansas, and robs him of his life, his horse, and $150 in cash. Mattie leaves home to avenge her father's blood. With the one-eyed Rooster Cogburn, the meanest available U.S. Marshal, by her side, Mattie pursues the homicide into Indian Territory. True Grit is eccentric, cool, straight, and unflinching, like Mattie herself. From a writer of true status, this is an American classic through and through. This mass-market edition includes an afterword by award-winning Donna Tartt, author of The Little Friend and The Secret History.